Travel Bedford has been created by Sustrans and Bedford Borough Council to help residents and visitors to have a clear, one-stop-shop about travelling actively and sustainable around the borough. In July 2012, Sustrans and Bedford Borough Council were awarded grant funding from the Department for Transport out of the Local Sustainable Transport Fund. This funding is aimed at improving cycling, walking and public transport links with Bedford’s two railway stations and to increase active travel within Bedford in general. Travel Bedford has been funded from this Local Sustainable Transport Fund. Sustrans have provided the content for this site and Bedford Borough Council manage the design and construction of the site. Download Bedford’s Clean Streets App for smart phones so you can report problems when you’re out and about. The map below gives information on roadworks for road users in and around Bedford Borough. 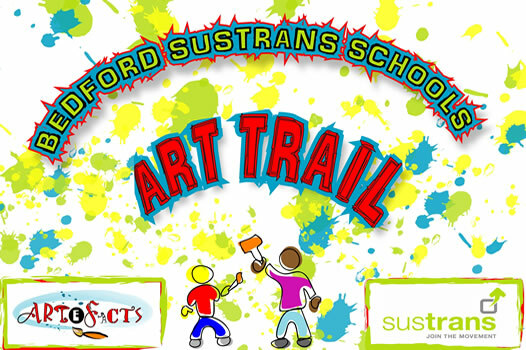 During August 2016 art work from 7 schools in Bedford will be on display on a circular walking and cycling route near Danish Camp, MK44 3QG. Enjoy some fresh air this summer and have an adventure spotting the art work in the trees while walking, scooting or cycling around the 3 mile, entirely off-road, circular route. For more details please contact Yo.Higton@sustrans.org.uk or call Yo on 01234 276048 .